On April 12, 1972, Imperial Oil Limited donated it's collection of C.W. Jefferys historical illustrations to the Public Archives of Canada. In a brief, 15-minute ceremony Iast month, Imperial parted with a 400-year heritage embodied in the works of famed Canadian artist C. W. Jeflerys. Acquired by Imperial in 1952, the more than 1,000 historical drawings and paintings by Dr. Jefferys were presented to the Public Archives of Canada on the occasion of that institution's centennial year. During the collection's 20-year span with Imperial, Jefferys' most famous works were arranged in five separate portfolios for distribution to educators, researchers and librarians. Indicative of the extent to which the portfolios were used is the fact Imperial has distributed more than 489,000 of them during the past 15 years. The Jefferys works also played an important part in a 1967 centennial issue of Imperial Oil Review - "The Formative Years". That issue was so popular it was later reproduced as a hard-cover book, published by Ryerson Press (now McGraw-Hill). On hand to make the presentation to the archives was Imperial's chairman W. O. Twaits. As he put it, from the beginning it had been the company's intention that the collection be regarded as a public trust to be maintained and made generally available to the people of Canada. "As evidence of that intention," Twaits added, "this is not the first time we have donated Jefferys material to a public body. We were able to repatriate the drawings he did to illustrate the famous Sam Slick stories of Judge Haliburton of Nova Scotia from their then United States ownership in 1955. They were presented to the Nova Scotia Archives in 1957. So this is not a sudden decision on our part - it has always been an intention." Also on hand was Imperial's art director, Gerry Moses, the man who first recognized the value of keeping the collection together. He "convinced the (lmperial Oil) officers of the time that its purchase would be a valuable contribution to the culture of this country," Twaits told the assembled guests. "Gerry was not only responsible for recommending the purchase, he played a leading role in the production of the portfolios of the drawings that were made available in English et Francais to educators across Canada, and for many other things we have done to make the collection available to Canada and Canadians - always with the limitation that there be no commercial exploitation. And such there has never been," continued Twaits. With the symbolic presentation to archivist Dr. W. I. Smith of a well-known Jefferys work, Mr. Twaits turned over the entire collection to the Public Archives of Canada. Said Dr. Smith, "I feel the extent of the contribution of Imperial Oil has not been adequately appreciated by Canadians. After acquiring the Jefferys collection, the company has made every effort to carry out the implicit wishes of C.W. 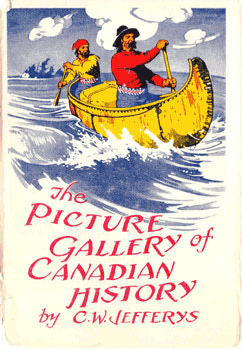 Jefferys - to make it widely and freely available to the Canadian people for research, exhibition, dissemination as illustrations in many collections and publications, and for use in schools in connection with the teaching of history. We are grateful to Imperial Oil for the spirit in which they have executed their trusteeship and for the confidence which they show in us by asking us to continue to carry out the inspiring mission of C. W. Jefferys."